It seems like there's a week for everything these days. National Pickle-Eating Week. International Pencil-Sharpening Week. Train Your Dog To Jump Rope Week. Ok, none of these are real (unfortunately for those of us with dull pencils pining for an official occasion to sharpen them). However, this week, March 4-10, we're pretty happy about a legitimate (and very important) observation: National Consumer Protection Week. The Federal Trade Commission -- the government entity that keeps us up-to-date on scams, schemes, fraud and other dastardly deeds threatening consumers -- created National Consumer Protection Week in 1998. But even as we celebrate the 20th anniversary of the NCPW, we should all understand that protecting ourselves from becoming victims can't be just a one-week-a-year effort. Although this week is a great time highlight the rights of consumers and call attention to threats to our money, identity and personal information, Bank Independent believes that educating our communities about potential risks is our daily responsibility. We're deeply committed to protecting the information which you entrust to us. When outside forces interfere with that protection, such as when a bad guy skims your debit card information at a gas pump, we make sure you're alerted as soon as possible, then we take steps to make sure that interference stops there. And of course, you'll never be held responsible for unauthorized charges. We keep a LOT of current, comprehensive information about what we do for you on our Identity Protection webpage, and encourage you to visit it often for updates. In addition, though, we also constantly educating ourselves so that we can educate you on things that you can do to protect yourself and your information from fraudsters and other criminals at home, work and abroad. 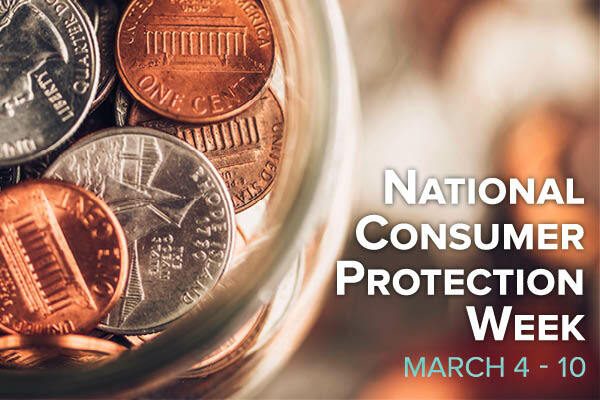 So this week, we'd like to share five of our best suggestions of how you can celebrate National Consumer Protection Week. None of these will take more than five minutes, but each can have a huge impact. What is This "Internet of Things" and Why Should I Care? This week our Federal Trade Commission will co-host four Facebook Live chats with other federal agencies on a variety of timely topics from frauds and scams to data breaches. Visit the FTC website for dates and times. Although there are an incredible number of tools and services available to help you keep an eye on your credit, the ultimate responsibility for verifying the accuracy of our credit reports lies with us, the consumers. After all, we should certainly know what should and shouldn't be on our own reports. Contrary to popular belief, there are ways to review your credit report without affecting your credit score or having to pay for a copy. For example, every consumer is entitled by Federal law to obtain one copy of your credit report every twelve months from each of the "big three" credit reporting agencies (Equifax, TransUnion and Experian). To order your reports, visit the official annualcreditreport.com website and select the "Request your free credit reports" button. It's up to you which agency's report you want to review and when, but because there are usually slight differences in each one, so the site recommends reviewing all three. This is one of the easiest things you can do to protect yourself from unwanted calls from telemarketers and, potentially, from fraudsters who obtain your name from the sale of these telemarketing lists. It takes literally less than one minute to add your phone number(s) to the Federal Trade Commission's easy-to-navigate DoNotCall.gov website. Your removal from lists should take effect in 31 days or less. You know those annoying pop-ups you get on your laptop reminding you that updates are available for your computer's operating system? Stop hitting the "Install Later" button! Just as cybercriminals are constantly working to find and exploit vulnerabilities in software (and now, even hardware), computer companies are constantly working to stay ahead of the bad guys by identifying and repairing potential holes in your system's security. Sometimes the bad guys get there first, so the software company issues a quick fix to keep you cybersecure. These updates are timely and important, so when they are offered, take advantage of them immediately. If you're not sure how to check to see if you're running the most up-to-date version of your computer's or mobile device's operating system, check your "Settings," "Control Panel" or other maintenance-related section for recent updates, or simply Google "What is the latest update to [insert your operating system or device name here]" and follow the instructions you'll most likely find with the information. And remember that most all devices offer software updates--even your gaming systems and digital TV devices! I've Done All Five Things. Now What? See, I promised those would be super-quick and easy! But staying on top of cybersecurity and consumer-related threats is an ongoing task. We'll do whatever we can here at Bank Independent to keep you up-to-date, but hopefully you've also found some additional tips and resources here in this blog that you can revisit to stay informed 24/7/365! Bank Independent does not endorse, nor is responsible for the content in the linked 3rd party websites. Bank Independent's privacy policies do not apply to these linked websites.